We all instinctively know to hide our phones while driving when we see a police car, but that doesn’t make using them any less illegal. (And it’s incredibly dangerous too, by the way.) 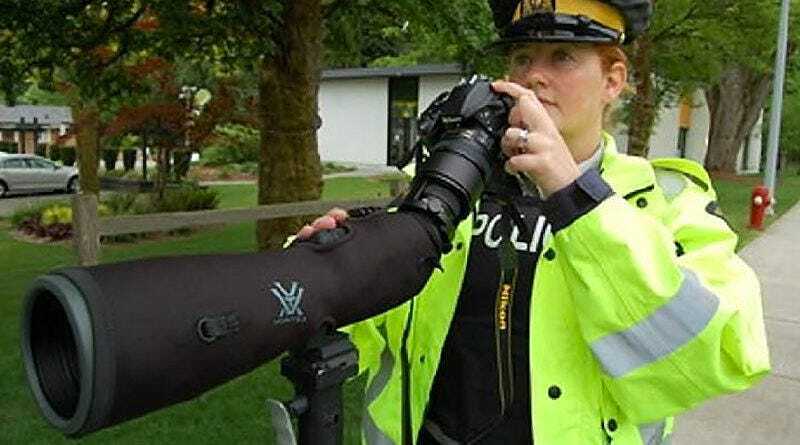 To catch drivers in the act, traffic services in British Columbia have been using spotting scopes—which feature a distinctive bend to make them more comfortable to use—for years now. Now the police are adding a 24.2-megapixel DSLR to the rig to capture photos of the illegal act. RCMP isn’t saying where the spotting scopes are being set up for obvious reasons, but it has admitted they are primarily being used at intersections t which drivers are stopped at a red light or a stop sign—where it’s still illegal to use your phone. It’s also easier for officers to snap a sharp photo of the offense when a vehicle isn’t whizzing by. Making the RCMP.’s newest weapon against distracted driving publicly known will hopefully serve as a deterrent to drivers. Additionally, starting on June 1, distracted driving fines in British Columbia will raise to $543 Canadian for the first offense, and $888 after that. Better to just let that last text go unanswered.